Homeowners know when they're cold and they know where their cold. They may not know how to light a pilot light, or air seal an attic floor, or balance a home heating system, but they know when they are cold. Bedrooms are often the coldest room in the house and most often people just live with it. Stick the kid in the cool bedroom, throw a couple extra blankets on the bed and tell them to finish their homework. Flow dampers are a bit unusual in my neck-of-the-woods, I don't see them very often. Flow dampers are added to a heating system to allow manual adjustment of the flow of air to the registers. With dampers, the flow of conditioned air can be balanced so warm and cool areas of the home can be eliminated. To keep from putting increased pressure on the furnace fan motor, when one damper is closed down another damper should be opened up. Sometimes, I believe a heating contractor may throw in a bunch of flow dampers when he looses his pencil and can't be sure of how big to make the heating ducts or how many registers need to be in a room. In this way, the cool room will get a larger share of the air coming from the furnace. This repair can still be a do-it-yourself'er if your willing. Heating duct material, both ridged and flex, can be purchased at your favorite home store. Some zip ties, a few sheet metal screws, a sharp knife and a pair of tin snips should do the trick. This adjustment can be very effective - especially in a manufactured home. A section of the main heating trunk ( the plenum ) needs to be opened up so a metal baffle or shield can be placed in the main trunk line that will direct more air into the heating duct that goes to the cold room. This is a very effective way to grab more of the conditioned air that passes down the main heating trunk and direct it in the direction you want it go. This is an inexpensive and permanent fix that works very well. This $30 part won't create more heat, but it will pull more heat to the cool room. The booster fan should be installed as close to the offending room as possible and can be wired directly back to the furnace fan so the booster fan will run each time the furnace comes on. Installing it can be a pain. A section of round metal duct either needs to be dropped down or added to the system. 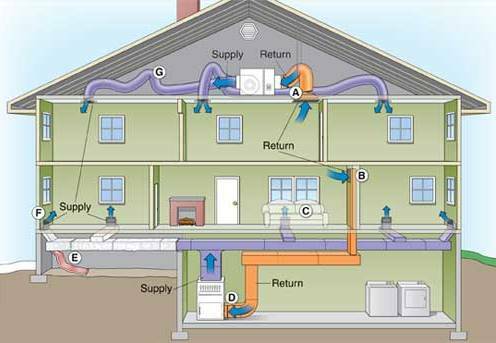 Be sure the duct system is air sealed or this added fan will pull unconditioned air into the system and lower your energy efficiency. If you live in the South Bay Area of California and you are dealing with cold spots in your house- please visit Sandium.Com to schedule a visit with one of our technicians. by Don Ames, a home energy auditor that is your host at http://www.detectenergy.com and the publisher of the eNewsletter, the Energy Spy Insider. Nice post it may serve as good source of information regarding on home heating repair Greendale. It's a detailed post, educational and informative for those looking for home heating ideas. Thanks. Thanks for sharing with us.This provide more useful information for us. I have one of my Air Conditioning Repair Portland business, i hope you like it. Nice that I found this blog but supposedly I'm looking for the post of home heating repair Greendale. Great post. I was looking up Doylestown heating when I came across your post. I just bought a house and the heating system is very old so I was thinking about updating it for something a little more efficient. I will have to send this to my boyfriend, thanks so much for sharing Don. Repairing air units is not a defined process. It can involve extensive investigation of an issue. Specialized professionals would not be needed if all repairs were easy. Experts in the field have vast knowledge of ventilation, cooling, and heating. That's a very valuable HVAC advice, Five stars for you! Thanks for the information. I wouldn't recommend installing or doing a heater repair, or repairing any home appliance that could be really dangerous if malfunctioning. I once caused a small gas leak trying to repair my hot water heater. such a nice information ...HVAC School can help to use your cleverness as well as your hands to bed in, maintain, and repair heating, ventilation, and air conditioning systems. HVAC/R programs also include training in refrigeration systems. The heating and the air conditioning systems are probably the most important pieces of equipment in your house. The best home heating system boost heat in cold in our society that has the great demand in these days for greendale furnace repair actually i am also knows about this little bit.